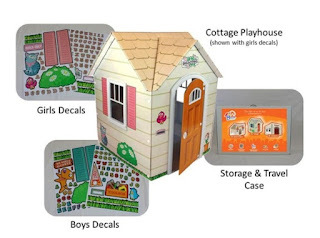 Beezer Playhouses are perfect for kids who love imaginative indoor play! Each playhouse comes with a variety of letters, numbers, and accessories that offer a personal touch. This would make the perfect back to school surprise for your little one or if you have a birthday coming up! *Disclaimer: Health, Beauty, Children and Family is not responsible for prize fulfillment. Good luck! my daughter and son would have a blast! I would give this to my daughters! This would be for both my kiddos! I would give this to my daughters as a Christmas gift, they would love it! My son has a big imagination,, He would love this and next month is his birthday so this would make a great gift!! I would give it to my daughter for Christmas!!! She would love it. I'd give it to my twins! I'd give it to my daughter! Thanks! I would give it to my 2 grandbabies. I would give it to my four little girls! I just HAVE to have this for my beautiful niece!! !